Check out: Hyundai Verna vs Honda City vs Toyota Yaris: Petrol Auto Comparison. Hyundai Verna prices start at Rs. 8.09 lakh for petrol and goes upto Rs. 12.85 lakh. The prices of Verna diesel variants start at Rs. 9.34 lakh and the top-end diesel is priced at Rs. 14.05 lakh. Hyundai Verna is available in 13 variants and 5 colours. Share your experiences with Verna? The claimed ARAI mileage for the Hyundai Verna petrol is 19 kmpl, and for the Hyundai Verna diesel is 24 kmpl. In addition to a facelift, the Verna gets much needed improvement in dynamics and high speed stability courtesy the reworked rear suspension. Q. Creta is better or Verna? Q. I am confused between Brezza and Verna fluidic, Which one to go for, I know both are different segments these are the 2 which I like. Q. Which car is better i20 Asta O diesel or Verna E base model diesel? If you want tl go for manual.......city is the best option.....see fasbeam vlog on youtube about city! Of course you should go for verna. In terms of everything Verna is the best in its segment , only in terms of headlamps' light city is better but u can use HID in verna then its the best . Q. How is the pickup of Verna 1.4 crdi ex diesel?Does it feel underpowered?Please note Verna 1.4 ex diesel whose max power is 89 bhp and torque is 220Nm. 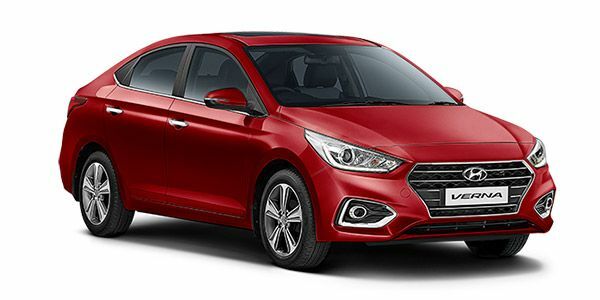 It's only a year since Hyundai launched new Verna in the Indian market (August 2017) and although the launch of the facelift is still some time away (H2-2020), the company has already started working on it. Along with the changes in soft body elements (sheet metal, grill, bumpers etc. ), the facelift Verna is speculated to feature a brand new 1.5-liter diesel engine which will replace the current 1.6-liter oil-burner. This will be done primarily to comply with the BS-VI emission norms which will be effective from April 1, 2020. Besides being cleaner, the new engine is expected to be more fuel-efficient (owing to its reduced capacity) but it may also down on the output. A new 1.5-liter petrol engine is also on the cards and though details are still sketchy for now, one thing is certain that it’ll integrate a hybrid motor system for higher efficiency and cleaner emissions. The facelift version is also expected to feature high on the connectivity and Telematics; will be a focus area for all the future developments, according to the company. Just so you know, the current generation Hyundai Verna is priced in Indian market at Rs 7.90- 13.0 lakh (ex-showroom, Delhi) and is available in both petrol and diesel versions. Further, Hyundai has provided the convenience of automatic in both fuel variants and Verna compete against the likes of Honda City and Maruti Ciaz among others. The new Verna looks like a baby Elantra. It has traded the old sporty persona for a slightly more elegant and sophisticated look. It gets the signature Hyundai elements including the new cascading grille, and the large sweptback headlamps. The side profile largely remains similar to the older car whereas the rear now gets LED taillamps, similar to the one of the Elite i20. It isn’t as spacious as the Honda City or the Ciaz, nor is the boot as large. This apart, it gets everything else nearly spot on. The sedan also borrows quite a lot of features from its elder sibling, the Elantra. Three key highlights include the sunroof, ventilated seats and hands-free boot release - all of which are limited to the top-spec trims. The usual feature set such as the 7.0-inch touchscreen, rear air-conditioning and steering-mounted controls are on offer as well. The Verna gets a pair of 1.6-litre engines that are among the most powerful in the segment. However, don’t let the big numbers fool you. The Verna isn’t about all-out performance. It’s strength lies in drivability and everyday usage. Both engines are refined and easy to drive. The optional 6-speed automatic bumps up the convenience quotient. The Hyundai Verna come in a total of 4 variants the automatic transmissions being offered on the EX and SX (O), the total variant count goes upto 12. The EX and the SX trims offer most bang for buck. We’d recommend the SX since it offers the feel-good features such as the touchscreen, sunroof, projector headlamps and 16-inch diamond cut alloy wheels for a reasonable premium. Maruti Suzuki Ciaz: A competitive pricing, a refined and frugal diesel motor and a familiar brand name have allowed the Ciaz to play ping pong with the City for the top slot. With the benefits now washed away, the Ciaz will have to up the ante with the facelift that’s due next year. Skoda Rapid: The Skoda Rapid not only looks European but also feels European; and that's because it is European. The new face alone gives it an elegant vibe as it draws inspiration from pricier cars instead of looking like a hatchback (Fabia). The Rapid's tank-like build quality and mature driving dynamics are its strengths, while a thin service network and high maintenance costs keep potential customers at bay. Volkswagen Vento: The Volkswagen Vento shares the platform, powertrain, strengths and weaknesses with the Skoda Rapid. The Vento, however, desperately needs a generation change or at least a facelift. It has a heavy build quality and a great balance between ride and handling. But, these are features you'll appreciate only after you've lived with the car for some time. And once you have, there’s no going back to anything else. The new Verna has matured, and how! It’s evolved into a classy package that drives well, packs in all the tech you need (and more) and priced reasonably as well. If you’re going to be driving solo most of the time or don’t really care about the folks at the rear - the Verna is a near no-brainer. Hyundai Verna buyers looking for an automatic need not compromise on features anymore! Hyundai Verna has all features which I had look for. Excellent mileage for daily use. Diesel engine has good power and mileage.